Electrum, the popular wallet which is used to store Bitcoins was reported recently to be under an attack to its servers. Hackers are trying to compromise the servers and steal the funds of users who run an old version of the Electrum wallet sending them a malicious update which gives them a compromised version of the Electrum wallet from the hacker’s website. In a tweet a few days ago the Electrum team reported that their servers were under Dos attack, telling their users to be careful when they connect the wallet to the servers. The news quickly spread across the web and here it is a Reddit thread with information about the problem. Please be patient trying to find a server that works for you (disable auto-connect doing so). 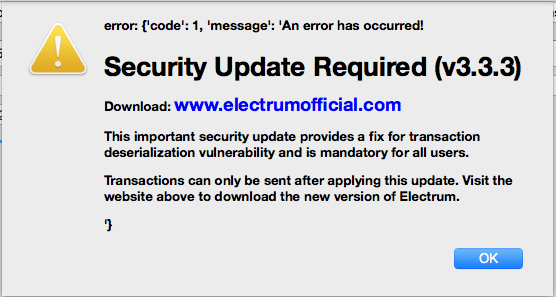 Do not download alternative Electrum versions from random sites stating they will fix this issue – those are by scammers trying to steal your coins! A security analyst told Hard Fork that in case those malicious versions of Electrum gets installed all the funds on those old versions will be immediately lost. Hack in cryptocurrency is a common thing since it is a new technology and most of the people neglect the security of their crypto wallets, and hackers have big incentives to hack on wallets because of the high-value cryptocurrencies have gained in the last years. It is better to use cold wallet hardware that is not connected to the internet like Ledger Nano S or Trezor.